Say that two individuals began, at the same moment in time, to sit down with a pen and ream of paper. They will copy out the bible word for word. One of the pair may have been Daniel Rapley, graduate of an art MA at Chelsea. His work is soon displayed on a plinth and beneath protective perspex, with a witty title: sic. The other bible would most likely sink without a trace, unless it was the work of a religious nut. In which case, he or she may be deemed sick with a ‘k’. Given the apparent futility and questionable sanity of much of what artists do, it is clearly important that graduates get support. Herein lies the value of the Catlin Guide. “Making work after graduation can be difficult without the validation that art schools and tutors provide,” says Sophie Percival, who is now free to explore her preoccupation with striking environments. Rapley and Percival are just two of 40 hot tips for the future of art. The guide is compiled by Justin Hammond who visits close to 50 degree shows, speaking to tutor, curator and collector alike. More than just a list, these 40 are also validated by the production values of the guide itself, which comes in a highly tactile baize coloured slipcase. And packaging is important because, as most graduates no doubt learn, a professional appearance soon matters. It could be the difference, for example, between Sic and certifiable. 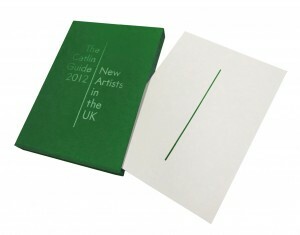 You can get a copy of the Guide from the London Art Fair or any of the distributors listed on the Art Catlin website here.